If you are looking to dine in comfort, and still have those gorgeous sea in full view, then Cafe Azul at Cidade De Goa hotel is where you should head. Be it breakfast, lunch, dinner or in between, they've got it all. Very few restaurants in Goa have gorgeous views and air-conditioning, so the fact that this one has both makes it perfect for those hot and humid days. On the cooler nights, you could always sit outside overlooking the pool and that Dona Paula Bay, spotting the jetty in a distance. 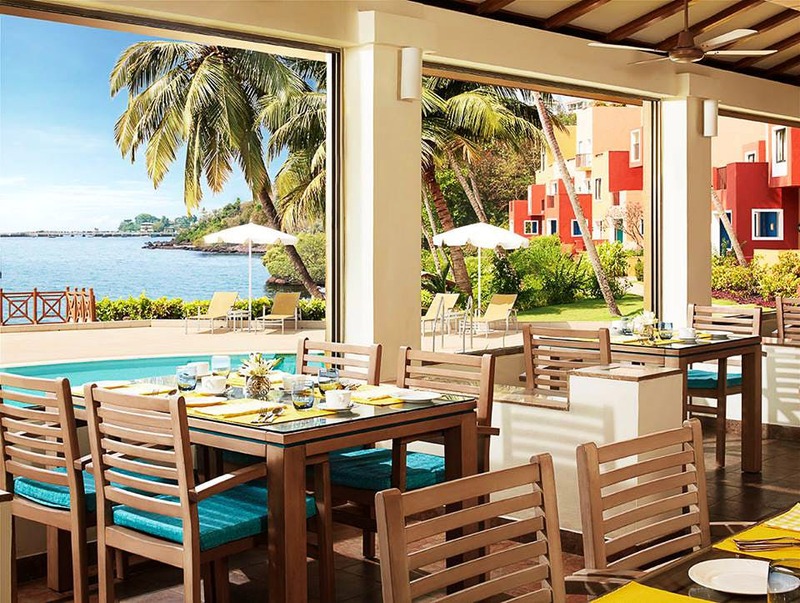 View aside, their Goan delicacies, pizzas, pastas and burgers and more make this a rather nice all-day dining option. And they do some great pop-ups, like the Saraswat Thali food festival, which acquaints us with one of the more unexplored cuisines of Goa. The dishes at the event came in a lovely silver thali, with various kinds of local veggies. Everything was prepared Saraswat style with an option of unlimited puris, rice and other accompaniments, including a a yummy modak since it was Ganpati time. So, keep an eye out for these pop-up food festivals as well as chilled beer on tap from Goa's first microbrewery Susegado. The service can be very slow, and sometimes you need to wait a while before someone even takes your order. But hey, it's Goa, who's in a rush, anyway? They even have buffet combos, which means you could pick and choose all or just a few from a combination of a soup, salad, a main course or just a sandwich and dessert.